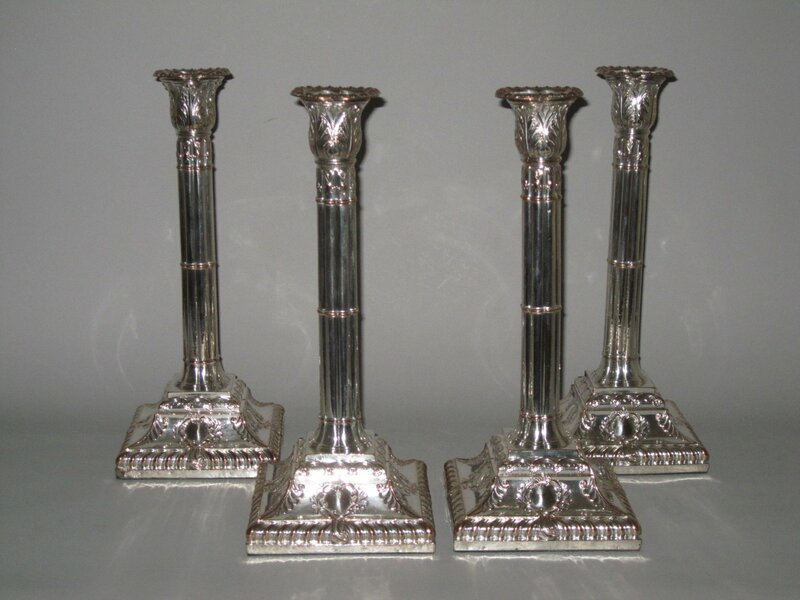 A GOOD SET OF FOUR EARLY OLD SHEFFIELD PLATE CANDLESTICKS. GEORGE III, CIRCA 1765-1770. Unmarked, but possibly by Ashforth, Ellis & Co. With octafoil columns with foliate capitals, on raised square gadrooned bases with foliate corners and foliate scroll cartouches. PROVENANCE: With S.J.Schrubsole, New York & ex Gordon Crosskey Collection. For a similar example see: Crosskey, G., Old Sheffield Plate, Treffry Publishing, 2011, figure 96, page 116.